EuroAsian Automotive is Environmentally Conscientious. Environmental Leadership is very important to George Rode and his crew at Euro-Asian. They have done an extreme amount to make as little impact to the fragile world as possible. 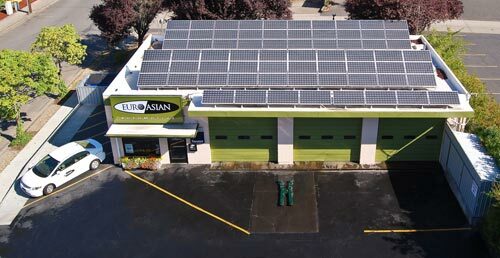 Euro-Asian has its roof covered with solar panels for renewable electricity production. This photovoltaic system, which cost in excess of $100,000, generates about 1/3 of the power required by the company on an annual basis. Imagine if all businesses did this how much less impact businesses would have, keeping in mind that over 47% of the US 's electricity is produced by coal! Click here to see how much energy our photovoltaic system is producing right now. Euro-Asian has gone above and beyond by installing bulk systems to supply most oils and antifreeze used in car maintenance. This means less plastic containers going into the landfill (oil and antifreeze plastic bottles are not recyclable). We are more than glad to take waste oil, antifreeze and batteries for recycling. We are Bring Recycling certified, the Rethink program. We were awarded the Mayors award for Sustainability. In 2018, we were the recipient of the Mayor's award for Bold Step. Electronic composites removed from vehicles are recycled. The bottom line is less impact on the environment. Euro-Asian has received the Eugene Garden Club Award for having a nicely landscaped business. Nice landscaping adds to the enjoyment and livability of Eugene.